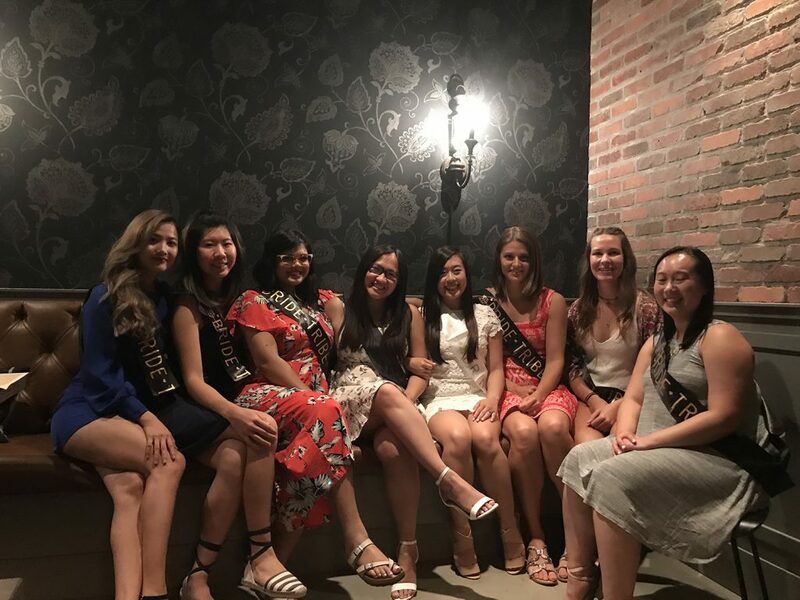 This summer I helped organize a bachelorette food and drink crawl in beautiful Kelowna, B.C. The bride loves food (as do I!!! ), so eating and sipping our way through the Okanagan was the perfect way to celebrate her marriage! On our Kelowna Food and Wine Crawl, we made four stops including one winery, one restaurant, one bar (speakeasy/restaurant), and one spot for dessert! I’ve listed our stops and crawl details below (including planning tips!) 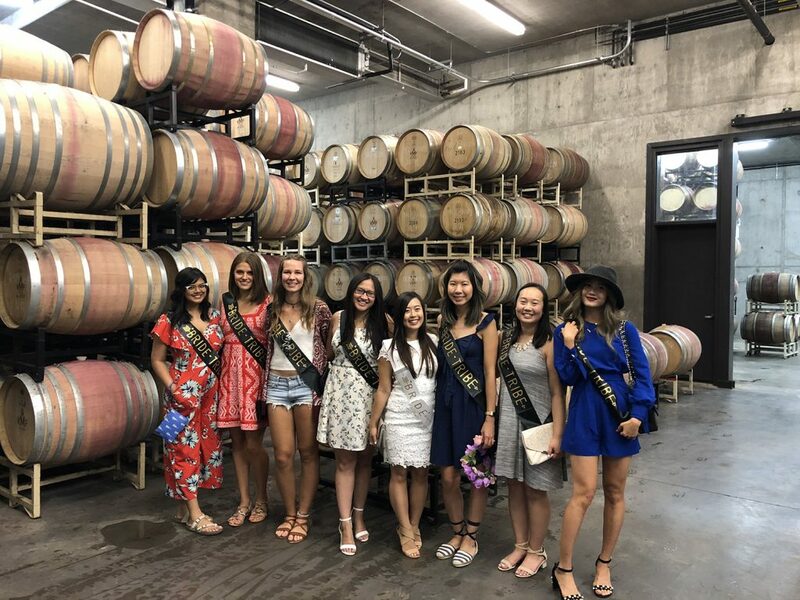 and absolutely encourage you copy our bachelorette itinerary, or choose your own stops (there’s lots of options in Kelowna!) 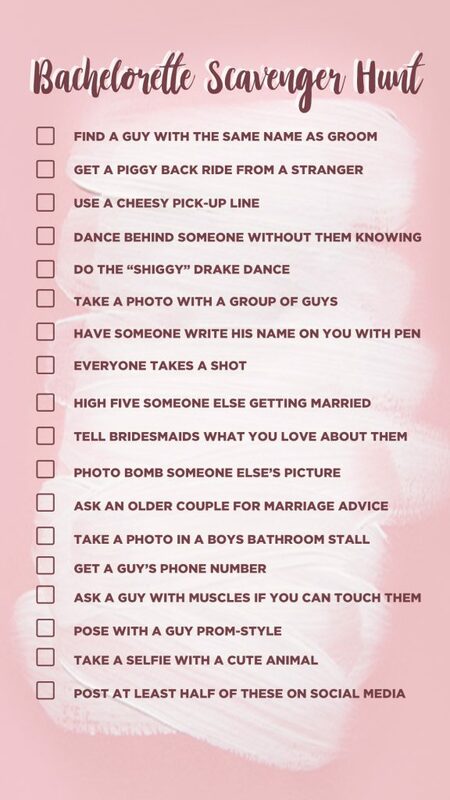 for a bachelorette you might be planning! 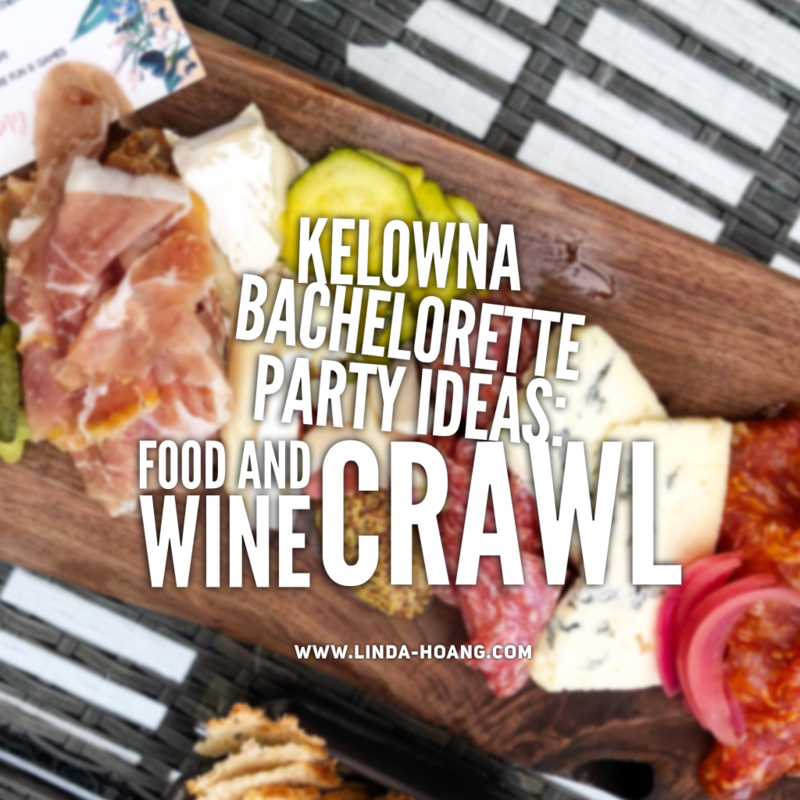 Pin + share this Kelowna Bachelorette Food and Drink Crawl blog! 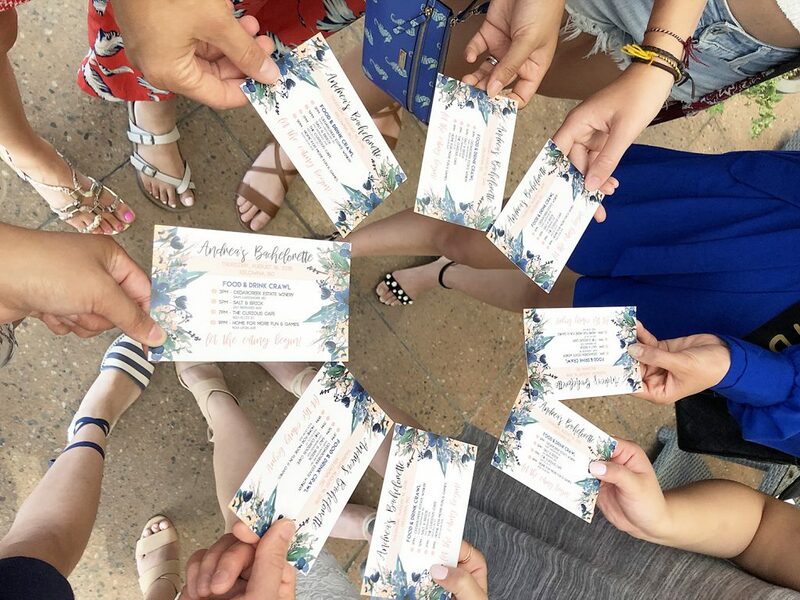 I’d recommend you select and book at least a few months in advance of your bachelorette because Kelowna is quite a hot spot for wedding events and getaways and your day and time slots will likely fill up fast. I would recommend coming up with a list of at least 10 spots (including some wineries, some restaurants, some bars), looking up reviews/menus, and gathering contact information all in one easy place. I wrote a draft email that I then edited depending on the location to smooth things out, but you can also call spots depending on our preferences. I found email to be easier for me, and then you also have a record of the communications. Don’t lose track of time! I’m proud to say we kept to our planned time almost exactly. Our last 3 spots were minutes walking distance from one another (along Bernard Ave. in downtown Kelowna), so that helped, but sticking to time especially for the first stop is important to ensure the whole crawl stays on track. Letting the places know you’re on a crawl when booking including stop times will also give them a better sense of how quickly to service you too. When inquiring, we let spots know we were hoping to spend under $20 per person not including drinks (except at the wineries where most of the cost went to the drinks). Ask if some places could offer any special sharing platters too! They may be able to accommodate depending on how many people will be in your party. Plan transportation in advance! We had one vehicle and a designated driver for most of the trip, and an awesome husband of the maid of honour who drove for a portion of the trip in a different vehicle. Once we got to Bernard Ave. we just walked to stops, so depending on your route, a cab may be fine or a designated driver for a portion of the trip may work too! Getting a tour of CedarCreek Estate Winery, the first stop of our Bachelorette Food and Drink Crawl! Our first stop on the crawl was to CedarCreek Estate Winery! We got a tour of the vineyard, shared a charcuterie board, and samples their lovely wine! For some of us who weren’t drinking, they had an amazing sparkling apple juice we got to try in wine glasses lol. We had a private host (thank you for the great photos Nick!) and learned about the history of the CedarCreek, which Did You Know: was one of the first 8 original wineries in the Okanagan!! Super cool. 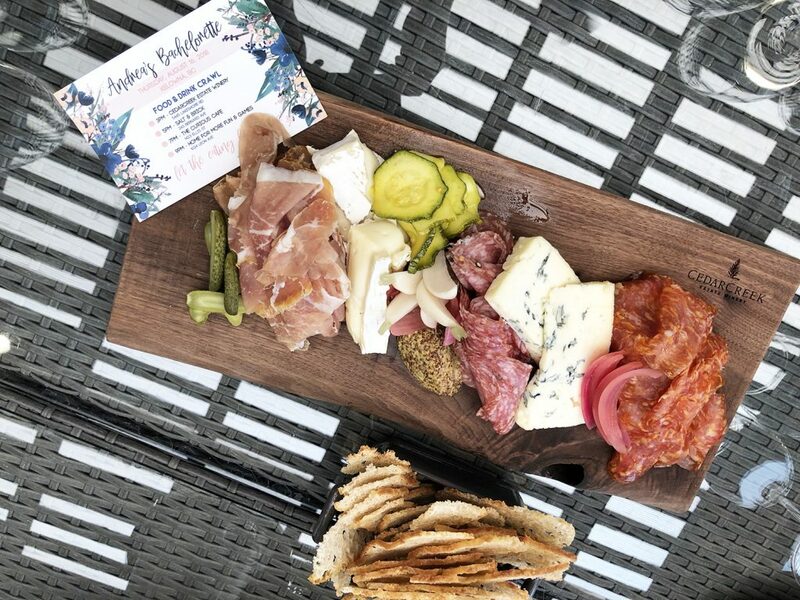 A delicious charcuterie board the ladies shared during our private experience at CedarCreek Estate Winery! Although we started our crawl at 3 p.m., if you wanted to do a full day of food and drink crawling, many wineries in the area offer private tours and bookings so I’m sure they could accommodate an earlier start and you could really make a full day out of it! One of the many delicious small dishes we shared at Salt & Brick! Our second stop brought us to the popular Bernard Ave. in downtown Kelowna where we would spend the rest of our night. 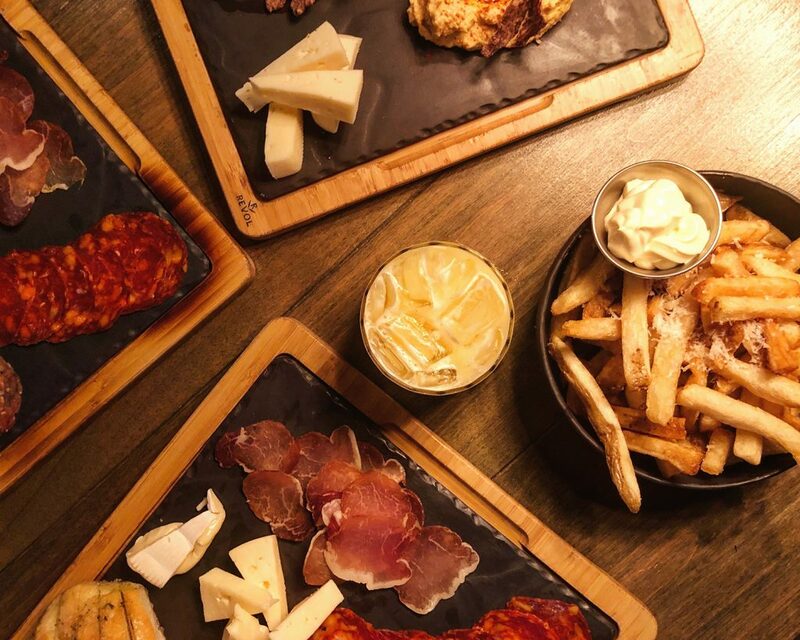 Salt & Brick used to be Salted Brick, a primarily charcuterie spot, but in 2017 changed to Salt & Brick. They switched up decor and menu but kept one thing consistent… the quality of the food! We shared a bunch of small dishes (that’s more its menu style now, though they still do some charcuterie!) including a delicious risotto, spaghetti, brussel sprouts, and tuna. I loved the spaghetti and wish there had been more! Also of note here: super cute vintage looking plates. Loving the floral Instagrammable Wall at Salt & Brick! 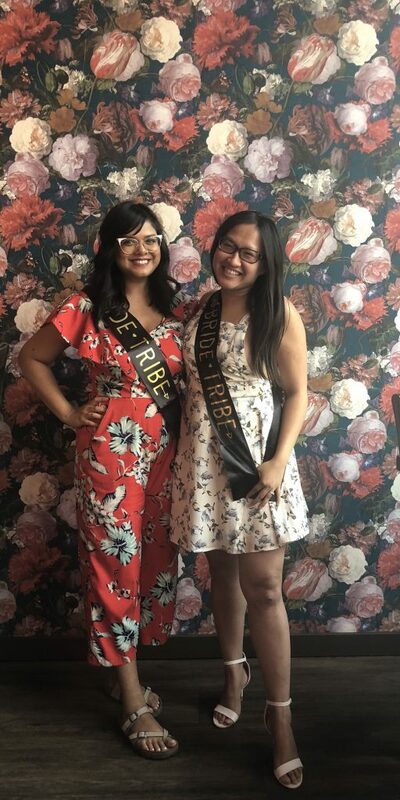 As well, definitely take full advantage of their indoor Instagrammable Wall for bachelorette photos! I couldn’t find a lot of Instagrammable Walls in Kelowna, but did notice some of the restaurants we visited had great indoor ones. Their neon sign is also cute—and makes you ponder your place in the world, lol. Part of the delicious spread we had at Bar Norcino at The Curious Cafe! 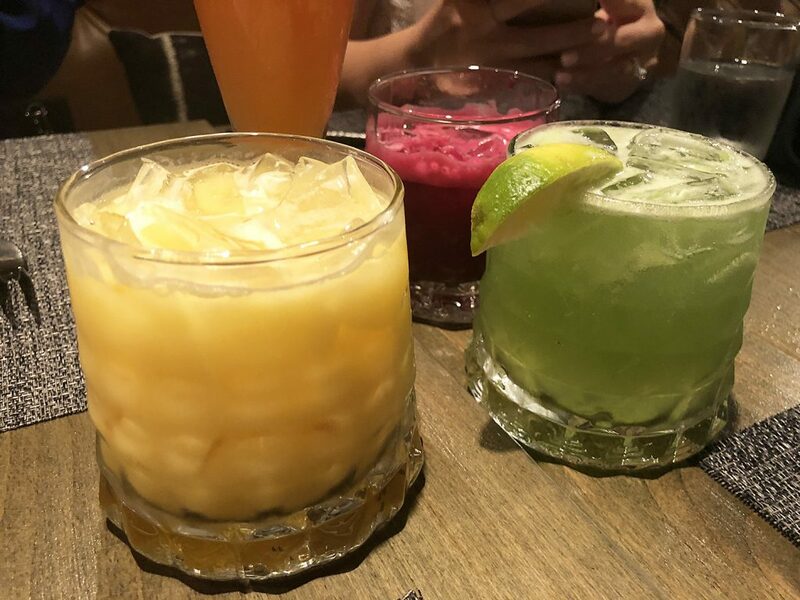 Colourful and tasty drinks at Bar Norcino The Curious Cafe. I loved the Pina Colada! We also enjoyed their cocktails at Bar Norcino. My favourite was their Tumeric Pina Colada with Bayou spiced rum, coconut cream and lemon. Ask for extra pineapple! Their cocktails are super colourful and look as fun as they taste, which is always nice. Bar Norcino looks and feels really cool—and had a great menu and service to boot. Don’t be fooled by the more casual/pub-like look of The Curious Cafe room when you first walk in, head to the back for the private area where there’s cool wallpaper, brick, and unique lighting. Inside Bar Norcino at The Curious Cafe! P.S. This place is also awesome for breakfast/lunch! Parlour Ice Cream – Locally Sourced + Crafted with Love! Now this fourth stop wasn’t actually part of the crawl because we waffled on whether there should be a formal fourth stop or if we should head back to the AirBnB we were renting for some casual games, but since we were already on Bernard Ave. and there were so many restaurants and a lively street, we made the decision to do dessert down the road at Parlour Ice Cream! Parlour is a cute soft serve ice cream spot that uses locally sourced ingredients and offers up to 20 flavours at any time, from your standards like chocolate, vanilla, cookies and cream and pistachio, to some more unique flavours, like whisky hazelnut, maple bourbon pecan, and blueberry cheesecake. 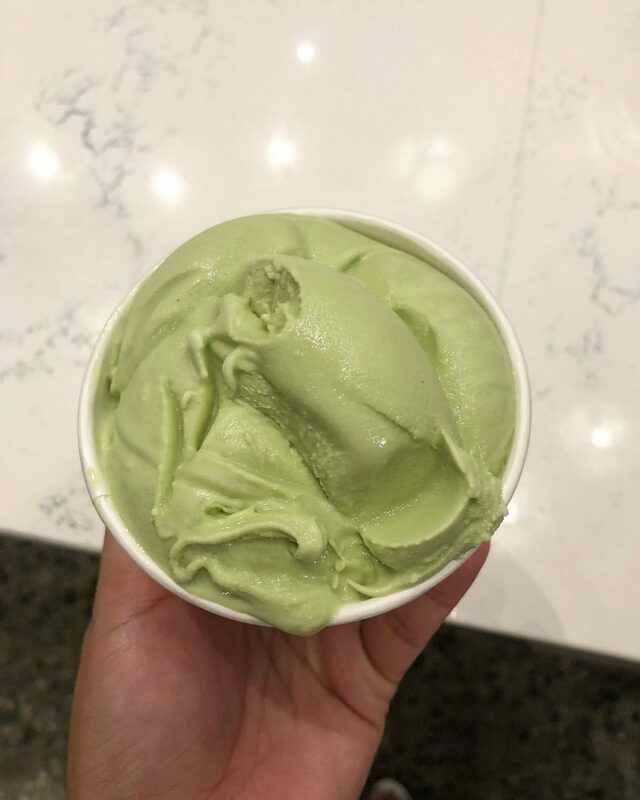 My overflowing single scoop of matcha ice cream in a cup at Parlour! They offer the most generous of servings! One scoop in a cup is literally an overflowing cup lol. For maximum cuteness, get it in a waffle cone! 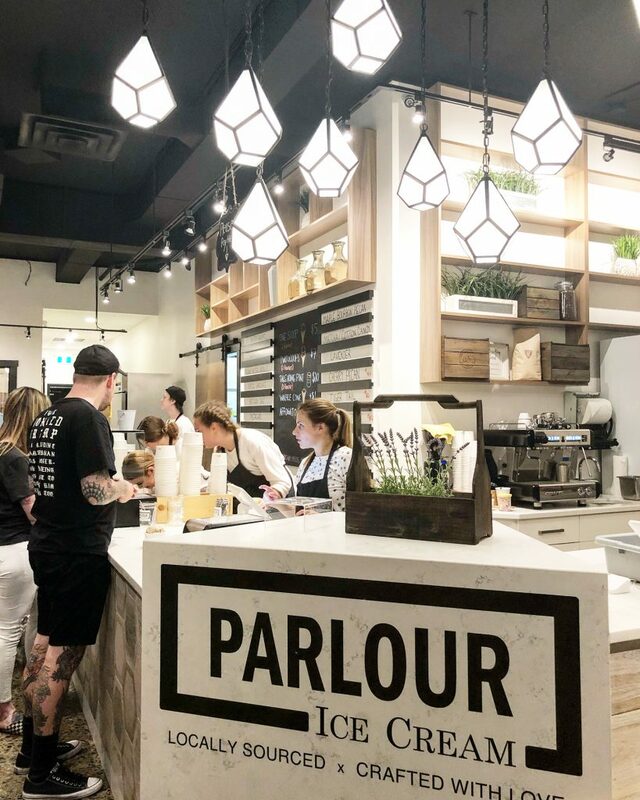 Parlour Ice Cream was a great final spot on our Kelowna Bachelorette Food and Drink Crawl. 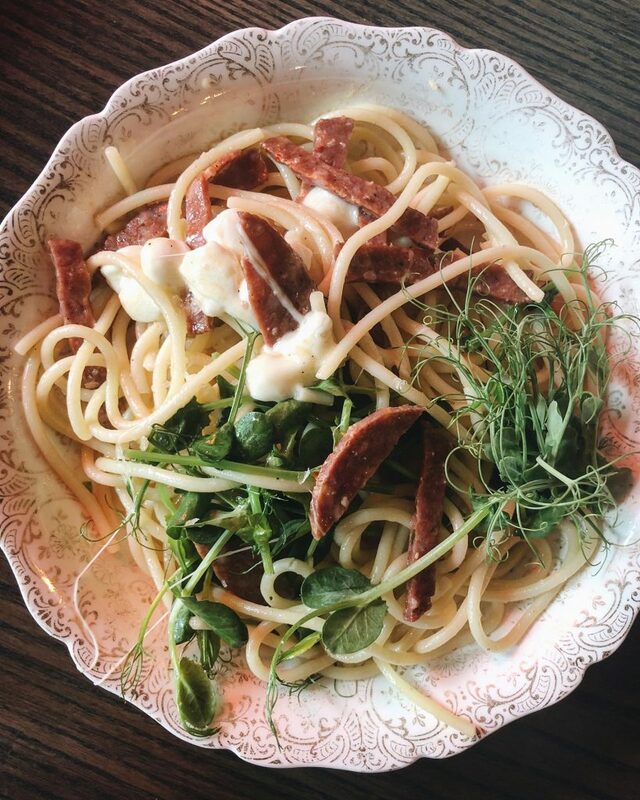 Whether you 100% copy our bachelorette food and drink crawl itinerary (I’d encourage it! ), or come up with your own route, doing a crawl like this was a really lovely last fling before the ring, and depending on your bride’s preferences, could really be the perfect way to celebrate. Throughout the night we also worked on a bachelorette scavenger hunt—things like, find a guy with the same name as the groom, or ask an older couple for marriage advice. That is best done around a neighbourhood like Bernard Ave. / downtown too! It was a lot of fun. I made an Instagram Story version of the scavenger hunt, which you can save/download below. Write the bride’s name at the top and the wedding hashtag on the bottom! Share photos, video and progress of the list on Stories throughout the evening! Our bride got about 80% completed, not too bad! Save/download this Bachelorette Instagram Story Scavenger Hunt! Add the bride’s name at the top and the wedding hashtag at the bottom. The Maid of Honour also put together cute crawl itinerary cards that each guest received when they arrived at the first stop! Let me know if you end up going on a food and drink crawl bachelorette! I’d love to know if my list inspired you!